FCT State Coordinator recognizing Azeez as the most outstanding corper. During the period of his compulsory national assignment from 2016 to 2017, Salawu successfully combined his duty as a Research Assistant at IITA with many other charitable projects in the FCT. These included serving as president of the SDGs Agro-Allied Community Development Service (CDS), and championing the group to acquire 5 hectares of farmland from the NYSC Kwali farmland. Under his leadership, the group also acquired 2 Demo Vegetable farmlands in Government Secondary School Jabi and Government Secondary School Gwarimpa where the CDS group trained students on theory and practical demonstration on land preparation and land management for vegetable production. He also led the group to IITA to receive agribusiness training from the IITA Youth Agripreneurs which would prepare them for life after NYSC. Apart from working with the CDS group, Salawu undertook some personal projects in his host Azhayaphi and Byazhin Across communities in Kubwa. These included the rehabilitation of Azhayaphi Community Borehole which had been abandoned since 2012. Before this intervention, community dwellers had to travel to far streams to fetch dirty and unhygienic water every day. He also provided 10 wooden chairs and desks to the less privileged pupils of LEA Primary School in Azhayaphi community where most pupils had to sit on the bare floor to learn. He also proceeded to construct and erect a directional signpost for LEA Primary School and donated an Inscription of Mothers Creed—a collection of statements aimed at shaping the lives of LEA Primary School pupils. All these projects were commissioned by the NYSC FCT Coordinator on 17 March, at the LEA Primary School Premises. 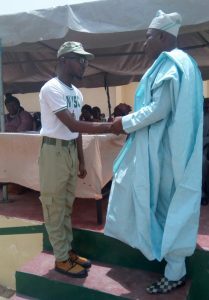 The NYSC conferred the award on Salawu during the passing out ceremonies of the scheme in Abuja earlier this month.